'Empty nest' syndrome and the desire to be her own boss inspired Lesley Murt to launch her bed and breakfast business in Padstow, Cornwall almost two years ago. Her three grown-up sons had moved out their home of 26 years and they had recently sold the family shellfish unit and shop. Despite no previous experience in the hospitality industry, business is brisk for Lesley at her two-bedroomed Padstow Poppies B&B with advance bookings through to the end of the year. What is the key to success in the B&B business? "I think if you offer a spotless room with a lovely bed with good quality Egyptian cotton sheets, a brilliant shower and then home-cooked breakfast with fresh, local ingredients you can't go wrong" says Lesley. "Many of our guests are from the UK but we have also had visitors from The States, Canada and Germany. This is Chef Rick Stein country, a great foodie destination as well as a haven for the walking and rambling community as we are right on the South West Coastal path. We already have bookings for the first weekend in December timed for the hugely popular Christmas festival in Padstow." The novelist Rosamunde Pilcher was born in Cornwall and over 100 of her stories (including the international best-seller The Shell Seekers), have been televised. "There is a TV production company who regularly film German language adaptations of Rosamunde's novels at the local stately home Prideaux Place. As a result, visitors from Germany, Switzerland and Austria head to our area inspired to visit the locations highlighted in these TV series," explains Lesley. "The summer months over the school holidays are very busy with families but in May and September we find we get older guests and couples keen to visit out-with the peak school holiday dates. Year-round we get one night stays from walkers as they continue adventuring along the coastal path." How did you discover freetobook? "Through a web search. 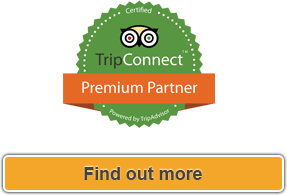 When I did a little deeper research into the properties that used the online booking software they were very positive so I decided to give it a go. The instant availability and online booking button works so well for our two-bedroomed B&B, it means I'm not tied at all and can be open for business from literally anywhere." What other freetobook products do you rate? 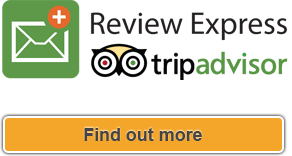 "We are a small operation so we don't use the OTAs like booking dot com however freetobook's Review Express is very useful indeed, posting up great feedback and testimonials onto the influential travel site TripAdvisor." "I love freetobook's integrated online payment system Stripe. I recently switched over from using PayPal and a pdq terminal. I would have saved £400 in the previous 12 months and should be on course to save even more this year given I'm no longer locked into monthly service charges and their higher commission rates." "I've met so many lovely people running my B&B. It's clearly the small and thoughtful touches that make the difference. We use Facebook to promote the B&B but I'm also determined to get to grips with Twitter!" says Lesley. 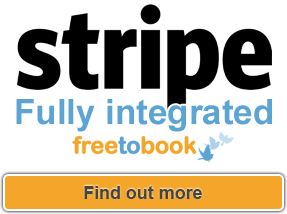 "I love freetobook's integrated online payment system, Stripe. I recently switched over from using PayPal and a pdq terminal ... I have saved £400 in the past 12 months"